This week Arnold participated together with Thomas Wellmann and Leon Purviance in the 7 day rogue like challenge! You can play the game in your Browser with the Unity-Plugin! KRAXLN is a game about rock climbing. In our first brainstorm session we thought about themes that could interpret the classical rogue-like dungeon crawler in different way and Thomas came up with the theme of rock climbing. As you might know rogue-likes are turn based dungeon crawlers that have some very distinct characteristics such as perma-death, randomly generated map/levels and often but not always one-hit combat. When you think about rock climbing a lot of those characteristics are already included in the mechanic. 3) random terrain: even though mountains are not really randomly generated each time you climb them, the route you can take to the top can be very different each time, thus generating a lot of „reclimbability“. We set out to make a mobile game that is very focused on moment to moment interaction, trying to condense a lot of interesting gameplay decisions in a very small sized game field. The main mechanic in KRAXLN is obviously the climbing. We decided to make the climbing very transparent so that the player can plan his way a head. 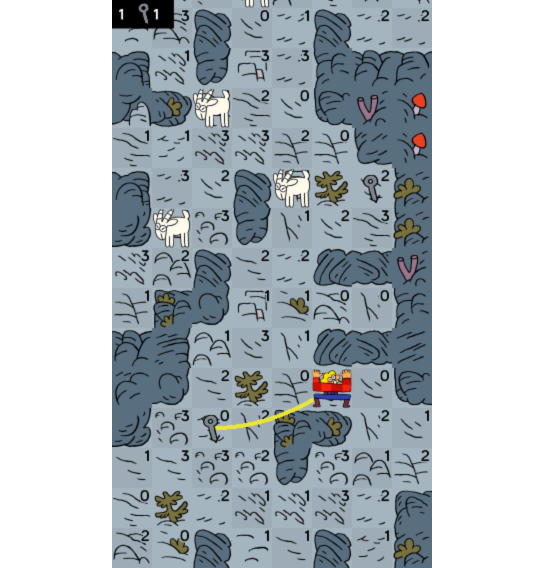 We use a strength system where each climbable tile has a strength value that is deducted from the player’s overall strength once he makes a move. There are several rules to climbing. 1) If the player’s strength drops to 0, he has to wait one turn to recover +3 strength automatically. This can happen on any type of climbable tile. 2) If the player’s strength drops below 0 (for example if you have 2 and you next climb is onto 3 strength tile) he get’s exhausted and has to wait until his full strength is recovered. This means each turn he waits he recovers +3 strength, but he can’t move until he has his full strength back. 3) The player can manually rest on 0-tiles. This makes an interesting mechanic as you can improve your position in relation the enemies, because you skip a turn. 4) Climbing onto 0-tiles gives you an extra turn where enemies can’t move. Each turn, depending on what you did, the enemies also take one turn. To kill an enemy you need to climb onto their tile. We decided to not have a health or energy system and making it one-hit combat. One additional mechanic we introduce is the climbing-hook. You can collect climbing-hooks, which you can use to save yourself from crashing. If you have hooked yourself to the wall and get hit, you return to the position where you attached the hook. This action breaks the hook and you have to find another one to attach it. This is basically a second life, but integrated into the level. The goal of the game is to reach the mountain’s top. In our Challenge version you have to climb through 3 areas to reach the top. Those areas get generated randomly and make every ascent a new challenge. Even though we a very happy with the amount of stuff we got done, we have more interesting things we would like to integrated such as changing environments and weather, base-camps with shop based skill leveling and more interesting enemies. Feel free to leave a comment on what you think about the game!